Michael Franti & Spearhead performed live at SunFest 2012, West Palm Beach, Florida's annual waterfront festival. Amidst the scorching afternoon heat that is all too common in South Florida, Michael Franti & Spearhead drew an enormous crowd at the local waterfront music festival, SunFest. From the moment the band took the stage, the crowd went absolutely insane. The fact that is was extremely hot outside went out the door as people danced and sang along to every song – it really was a great time. 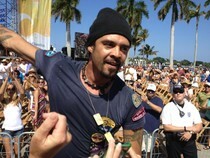 Several times during the live SunFest show, Michael Franti would venture out into the crowd and get up close and personal with his avid fans – they went absolutely bonkers. Franti and his band (Spearhead) performed a ton of songs which included “Hey Hey Hey” , “Life Is Better With You” and “Everyone Deserves Music”. All in all, Michael Franti & Spearhead put on a great live show at West Palm Beach, Florida's annual music festival, SunFest. If you have never heard of Michael Franti & Spearhead, head on over to http://www.michaelfranti.com/ to listen to their great music – you won't be disappointed.